Thanks to their wide range of applications, modern LED lighting systems have gained general acceptance in many areas, such as for example industrial design, architecture, the internal furnishings sector and advertising as well as many others. Despite an improved level of efficiency, a large part of the electrical power with LEDs is still converted into heat. 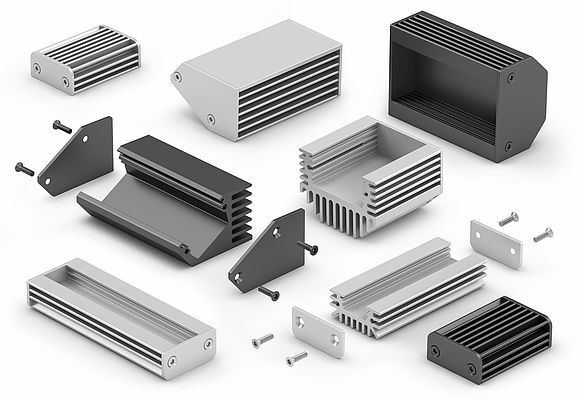 In order to avoid overheating of LEDs, there is a growing demand for special housings with efficient heat management, which help to optimise the heat discharge. To meet this demand, Fischer Elektronik has expanded its product range of heat discharge housings by adding an additional housing series, the G LED range. The new U-shaped housing profiles, which are open on one side, have integrated guide grooves to take LED line modules and slot-in cover plates or plexiglass discs, which can vary in their material thickness. The plexiglass discs and LED line modules are fixed by means of the lid plates at the front, which are screwed onto the housing profile. The housing profiles also have external cooling ribs, which ensure that the heat is fully discharged to the environment. The G LED housing series is available as standard in three different versions and three lengths (50, 80, 100 mm), as well as in two surface versions (natural-coloured and black anodised). Other lengths, surfaces and types of mechanical processing and printing can be manufactured to the customer's request.